I admit that I always have always been a bit of a germophobe. I remember back in high school my friend Tina (who is also a germophobe) and I would be stuck in the girl’s bathroom because neither of us wanted to open the door with our hands. We would wait until someone opened the door to go in and then we would run out. Seriously. Fast forward a decade and I am not as bad now, but I still do get grossed out easily. One of my issues is the bathroom handsoap and how icky it always gets as its used. I try not to think about the germs that are on the handsoap because what can I really do about it right? Well, wrong because I have found a product that puts my handsoap germy fears to rest. That product is Lysol Healthy Touch No-Touch Hand Soap System. The folks at Lysol must have realized that there are people out there with germ anxiety and would greatly benefit from a handsoap that no one has to touch! This revolutionary product helps to stop the spread of bacteria and kills 99.9% of the bacteria. It is so cool and fun to use too! Yes, I never thought that I would call washing my hands “fun” but I love using my new found gadget!! You simply put your hands under the sensor and it will automatically dispense antibacterial soap. No muss no fuss! I tried out the Soothing Cucumber Splash Hand Soap which came with my kit. It has a refreshing cucumber scent. It lathers great and leaves your hands smelling fresh and soft (and of course, very clean). It is available in other scents including Cleansing Tea & Ginger and Refreshing Grapefruit Essence. I am sure they smell awesome too! 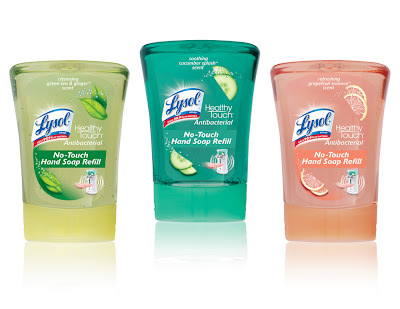 There’s a scratch and sniff on the handsoap so you can see if you like it before you buy. 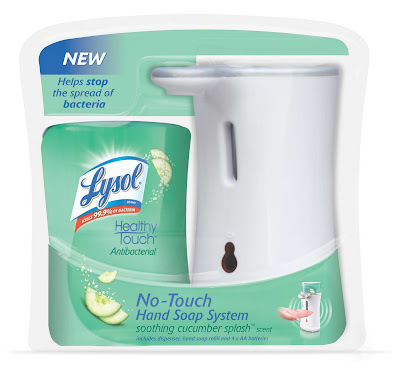 Lysol Healthy Touch No Touch Hand Soap System is sold in grocery stores, drug stores and mass retail stores nationwide. The price for the system is $14.99 (includes 1 dispenser, 1 8.5oz. hand soap refill and 4 AA batteries). The refills are $3.99. I am very pleased with my system and it comes highly recommended!! No more germy soap pumps here!